Signs are everywhere and I have mentioned my belief in signs to you MANY times. And again, this week I had another opportunity to be guided. I try to listen to the messages that are sent my way but sometimes the noise in my head is too loud, I’ m too stubborn or all of the above. On Tuesday, I had a coaching client mention that the latest Deepak Chopra and Oprah Winfrey 21-day meditation challenge had started again. 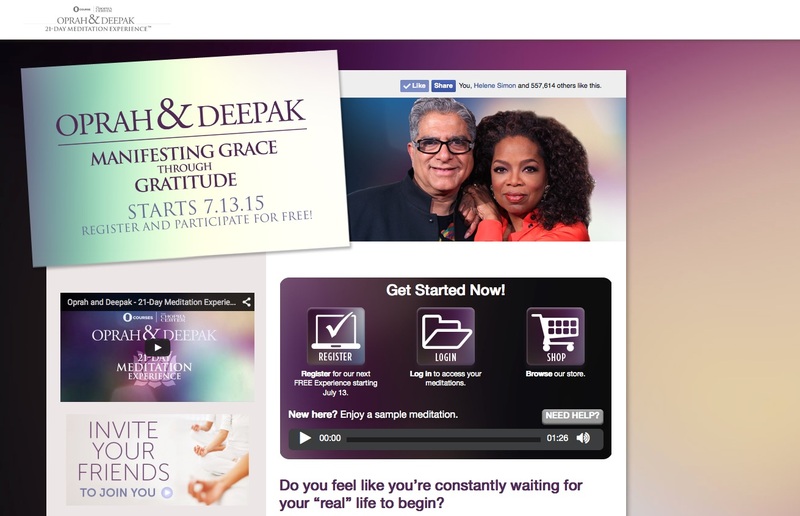 She’s a fan of the Oprah/Chopra meditation posse and mentioned that this series was Oprah & Deepak: Manifesting Grace Through Gratitude. As you know, we’re all about gratitude practices so that piqued my curiousity. Then that evening, at the end of yoga class I had a student mention that she and her husband have been meditating every morning. And, you guessed it, they too are following the latest Deepak and Oprah series. Message received! So I signed up yesterday for the series. Clearly, I am in need of gratitude and grace since it was stalking me at every turn. Previous Post It’s Summer…Be a Little Lazy! Next Post Life Lesson: Say Yes!